Just got alerted by Mehernaaz about terror attacks in south Bombay. 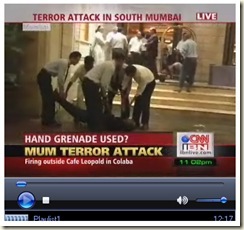 Firings outside Leopold, and blasts/firings around the Taj and Oberoi Hotels and VT station have taken place. Only CNN-IBN has news reports as of this moment. Their live video stream can be seen here. If you have updates, please post in comments. I canâ€™t believe what I am seeing on the television. My condolences to the families that were affected by these horrific crimes.